SHe by Morton’s introduces “Happy,” a new bar and patio menu offering small bites and an array of drink specials available from 5 to 7 p.m. daily. Eva Longoria’s lavish new Las Vegas restaurant, steps away from the main entrance of ARIA at The Shops at Crystals, is a stylish spot to enjoy early evening hors d’oeuvres and cocktails. The Official PADRES Gala After Party hosted by Eva Longoria at TAO Nightclub on Saturday night. The actress arrived shortly after midnight, looking stunning in a skin tight black leather dress which ignited a flurry of flash bulbs as soon as she hit the red carpet. 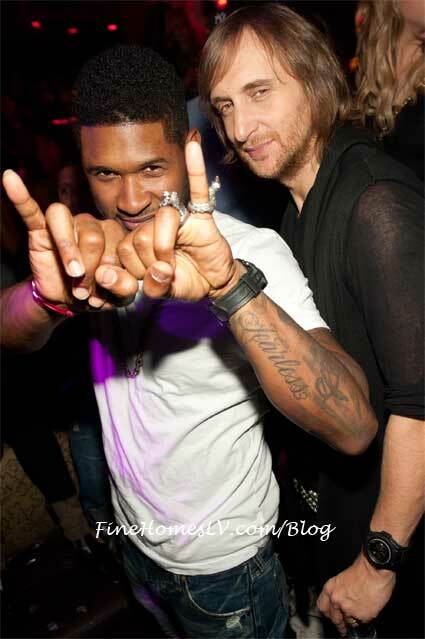 Usher and Nicole Scherzinger chose TAO Las Vegas to celebrate after the concert on Saturday. Joining the group taking over a string of tables on the dance floor were Will.I.Am, David Guetta, Natasha Bedingfield and dancers from the show. The Black Eyed Peas member, apl.de.ap, was looking fly in a zipper black vest, dark denim and stylish boots rocked with his signature mohawk and glasses as he hit the red carpet before heading to party the night away in style at Gallery Nightclub inside Planet Hollywood Resort & Casino on Friday night.